Of all the icons of American life, buying Girl Scout cookies is one of the annual obligations of life. Americans buy these cookies from parents selling for their daughters, from uniformed Girl Scouts in front of the grocery store, or from a family member. I can’t wait for my annual infusion of Samoas, the Girl Scout’s take on the macaroon. Caramel and coconut – how could we go wrong? Well, apparently, I need to spend more time to consider the issue of Girl Scout cookies and GMO ingredients. To be honest, I’m more concerned about the calories in each. But here we are. At the current time, there are genetically modified agricultural crops (GMOs) in some Girl Scout Cookies based on a range of market-related factors and depending on specific cookie recipes. In some markets, the specialty-ingredient Girl Scout S’mores sandwich cookie baked by Little Brownie Bakers is made with ingredients that are verified as not containing genetically modified organisms. Girl Scouts recognizes that many people have concerns regarding GMO ingredients, and we monitor member and consumer opinion on this matter while simultaneously addressing industry trends, scientific trends, and, of course, consumer preference. There was a time recently in the United States when Non-GMO and organic packaged foods were surprisingly rare, so much so that choice was a virtual non-entity and entire communities of people have no access to non-GMO options. But now, non-GMO has officially gone mainstream: one of the country’s most recognized institutions, the Girl Scouts of the USA (formerly known as America) has announced its first-ever (officially speaking, anyway) non-GMO cookie. You can almost see the glee dripping from the announcement. Once again, let’s take a look at Girl Scout cookies and GMO safety. This change happened because of a lot of noise that signified nothing. Time to examine it again. Why do people think that Girl Scout cookies and GMO ingredients are bad? It is important to note that there is worldwide scientific support for the safety of currently commercialized ingredients derived from genetically modified agricultural crops. The World Health Organization, the Food and Agriculture Organization of the United Nations, the U.S. National Academy of Sciences, and the American Medical Association all share this assessment. It is also important to note that in the future, GMO ingredients may offer new, cost-effective alternatives to feeding the world’s growing population. So, the Girls Scouts USA seem to be in conflict with their own statement. They think the science is right about GMOs, but, on the other hand, they need to pander to some of their scientifically illiterate customers. Some people believe that genes from bioengineered crops can be transferred to humans. No, they just don’t. Based on our knowledge of the digestive process, fats, DNA, carbohydrates, and proteins are broken down into their simplest components, and specialized transport systems move these simple components across the barrier between the digestive tract and blood. They have evolved to not transport full size molecules, partially because the blood is incapable of carrying large foreign molecules (or could induce an immune response). Moreover, small constituent molecules, like amino acids instead of the whole protein, nucleotides instead of long strands of DNA, or glucose instead of a long-chain carbohydrate, are more easily transported to locations in the body to be then used as fuel or building blocks for new proteins and DNA. We just have not seen a mechanism in the digestive tract that can move large molecules, like gene-length DNA fragments, into the bloodstream. Genes do not easily (if at all) transfer from one organism to another. When we eat corn or steaks, we do not morph into an ear of corn or a cow. Likewise, if we place the gene of a bacteria or a larger organism into corn, it does not suddenly transfer that gene to us. It simply doesn’t work that way. Some people believe that GMOs aren’t natural. If that’s true, then all of your food is unnatural, because we’ve been bioengineering our food for 10,000 years. We used artificial selection for thousands of years – our ancestors awaited a random mutation, say to make the corn ear bigger, and then selected for that trait to cross breed with other corn with the same trait. That mutation isn’t something special passed down from the gods of agriculture – it may arise from “natural”radiation, some chemical in the soil, random genetic error, or, ironically, gene transfer from some organism in symbiosis with the corn plant. Bioengineering merely speeds up the process by finding a trait and placing it in the plant, instead of waiting for a mutation. From the aspect of the DNA of the plant, it has no divine right to be in one form of the other. It just thinks it’s DNA – all DNA on this planet works exactly the same for all organisms. So don’t ascribe to some naturalistic fallacy, that is “natural” mutations are somehow more pure and wonderful than man-made mutations. That’s the ultimate ignorance of real science. © John Doebley – University of Wisconsin. Teosinte, the wild ancestor of corn, is the grain at the top of the photo. It’s mostly inedible, and it apparently tastes like dried potatoes. 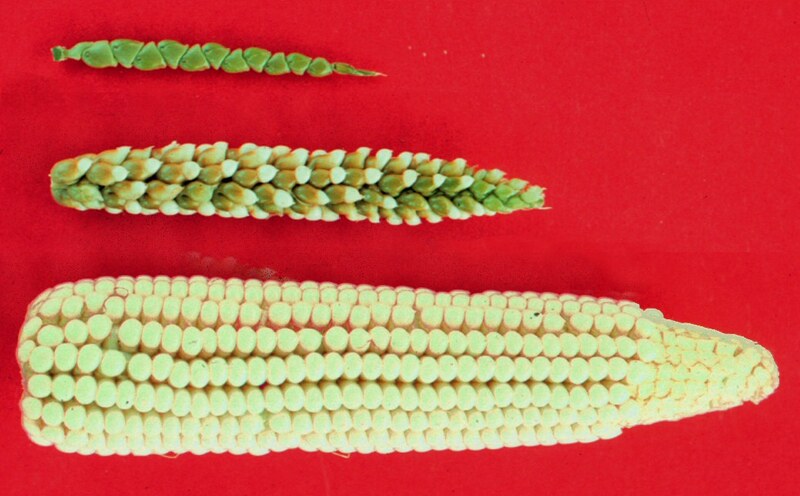 The middle one is a hybrid of teosinte and modern corn. And of course, the bottom is modern corn. Here’s an important point about corn. Less than 20% (and frequently a lot less) of genetic material of modern corn is related to the original teosinte species. There were literally hundreds of mutations, natural and otherwise, that got us from teosinte to the that delicious ear of corn we eat today. But it’s more than just that. The modern corn plant now grows more food than the original teosinte (even if it were palatable) – and we’ve even improved the productivity with modern biotechnology. Oh, and there’s that logical fallacy where the arguer conflates GMOs with Monsanto and its pesticides. It’s an irrelevant argument except for people who hate science. It would be like a climate change denier claiming that it doesn’t exist because the measurements were done in degrees Celsius, a foreign invention. By the way, GMO deniers use the same tactics and pseudoscience as your every day climate change denier. I have no patience with either. As leaders in STEM education, one would expect the Girl Scouts of the United States of America (GSUSA) to stand by science and evidence, which they’ve done until recently. The organization has been a battleground for the hot-button issue of GMOs, or food with ingredients derived from genetically engineered crops. In the scientific community, genetic engineering is accepted as safe agricultural breeding methods that can achieve traits that other methods can’t. But with far-reaching ideologically and financially motivated campaigns to disparage these techniques, combined with confusion and a marketplace dominated by buzzwords, “non-GMO” fluff has gained a foothold in the consumer psyche. It’s disappointing that the Girl Scouts have taken this tactic with the GMO pseudoscience, probably to sell more cookies (look, the selling of cookies is a great bit of training in entrepreneurship, so I’m somewhat sympathetic). But really, the science of GMOs, that they are safe, incredibly safe, should be paramount to anything else. This is the impact that these moms worry about most. Anti-GMO sentiment contributes to consumer fear and rejection, which influences policy makers and leads to the overly stringent regulations keeping real solutions from farmers’ fields. These include oranges engineered to be resistant to the disease devastating the industry, bananas resistant to the disease wreaking havoc in east Africa, where it is a staple food, and more. The work of scientists who have engineered solutions to real agricultural, nutritional, and environmental problems languishes in regulatory limbo. Entire counties of American farmers have lost the right to grow GMO crops that offer better yields and other benefits. This is a lot like the anti-vaccine movement. Those people invent pseudoscientific reasons to not vaccinate, which puts vast swaths of children at risk for diseases that were once long gone. It’s almost some elitist viewpoint – I won’t feed my children GMOs or give them vaccines, because my precious snowflakes are more natural and better raised than yours. I’m saddened by the Girl Scout cookies and the GMO labeling. But still, I’ll order some Samoas. I support the Girl Scouts, despite their being totally wrong on this topic.